This is a review of another recording from New Zealand's Exordium Mords which continues the raw, fast and brutal mixture of black, war, death and thrash metal of previous recordings with the album being called "The Apotheosis Of Death" and will be released in July by Iron, Blood & Death Corporation. A very dark and heavy sound starts off the album and after a minute the music gets more upbeat and black metal screams and death metal growls are added into the music along with some elements of thrash and technical death metal and after a couple of minutes melodic guitar solos and leads start becoming a huge part of the album's musical direction. On the other tracks the music starts to get a bit more heavier as well as speeding up and adding in blast beats and the vocals also get more deep and grim in certain sections of the recording and with this album the old school and technical death metal elements are utilized a lot more than their where on previous releases while the black, war and thrash metal influences are still a huge part of the bands musical sound and towards the end of the album back up gang thrash style vocals can be heard on one of the tracks. Spoken word parts and melodic clean singing can be heard briefly on some of the tracks and as the recording progresses the old school thrash metal influence really starts to become a dominant force of the album and the band also brings in an instrumental that utilizes a very powerful sounding bass guitar lead while the following tracks sees the band returning back to a more raw, heavy and aggressive direction as will as adding a good amount of melody into their musical sound and they also add in a few songs that are very long and epic in length. 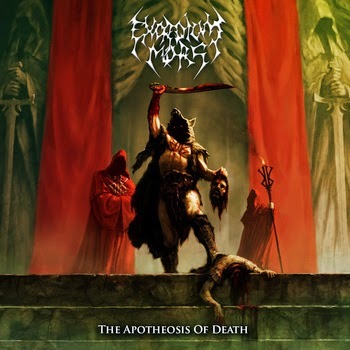 Exordium Mors remains true to their mixture of black, war, death and thrash metal on this album while also showing a great amount of progress and skill as musicians and they also retain the raw, heavy and brutal aggression of previous recordings while also adding new elements into their musical style, the production sounds very heavy and powerful while the lyrics cover Death, Roman Paganism and History and Anti Religion themes. In my opinion this is another great sounding recording from Exordium Mors and if you are a fan of black, war, death and thrash metal, you should check out this album. RECOMMENDED TRACKS INCLUDE "As The Vultures Descend" "The Corpse Of Your Divinity Now Burns" "Fire & Triumph" and "Blade Of Brutus". 8/5 out of 10.